“Why didn’t you say anything?”, says Samantha and looks at me with accusing eyes. 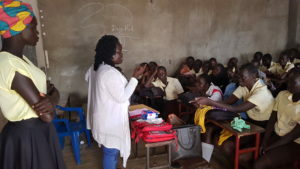 She is an 18-year-old student at a secondary school in Juba where former beauty pageant turned activist Manuela Modong holds monthly voluntary classes about female health. 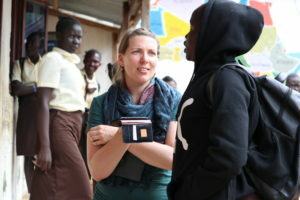 Anything related to menstruation is a taboo in most communities in South Sudan and is not part of the school curriculumn. The first period catches girls usually off guard. One student in Manuela’s class thought she was wounded. Another girl went to see the doctor who kept her in the hospital for three days and gave her drugs. She wasn’t ill, she just had her first period. Around 90 students have come on this cloudy Thursday afternoon to listen to Manuela. Although they are shy at first, their curiosity quickly wins. They bombard Manuela with many questions between giggles and chuckles. It’s a very emotional and lively session, so much that our fixer Nancy can’t help to chime in and teach the girls about how to avoid unwanted pregnancies and STIs. I stay in the background taking photos and writing down notes. But by being the journalistic fly on the wall, I have accidentally offended the girls. Student Samantha approaches me after the class, reprimanding me for not getting involved in the conversation. “You are older than us, you have to share your experience and knowledge,” she says. She got me there. Sometimes I get so absorbed in collecting and documenting stories, asking protagonists to open up and share their thoughts and feelings with me that I forget I’m not just an invisible observer – and that reporting shouldn’t be only about taking and getting input. Thanks Samantha for reminding me that little acts of reciprocity go a long way.